Plagued in recent years by wear and tear, the owners of Starrett City are facing a sticky problem at the sprawling Brooklyn housing complex just in time for its annual inspection by federal officials. Starrett City, the largest federally subsidized residential rental project in the nation, is grappling with a major leak that shut down the cooling pipes that service the complex’s air conditioning, forcing the owners to hand out fans to tenants this week as the mercury hovered around 90. 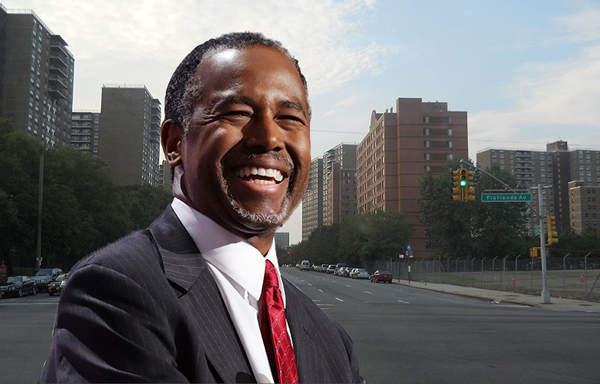 The bad news comes as the complex is in talks with the U.S. Department of Housing and Urban Development — led by Ben Carson, who was appointed to the post by President Trump, a minority owner of Starrett City — to inspect the complex sometime this summer, the New York Daily News reported. The complex — with 46 buildings and 5,881 apartments — is one of the country’s largest federally-subsidized developments and it’s received $491.7 million in federal funds since May 2013. It received $76.8 million in 2016 and $38.3 million so far this year, according to the U.S. Department of Housing & Urban Development. But HUD inspections in recent years have been poor. A score of 90 out of 100 requires inspections every three years, but Starrett City scored 89 in 2007 and 77 in 2009. The complex scored just 70 in October 2016 at its last inspections. Starrett City officials said the scores dropped when HUD cited “a series of minor, non-safety issues,” such as repairs that were being made to the buildings’ brick facades. The ownership — an investor group led by the family of the late Disque Deane — have reportedly pumped $30 million into improvements. In November, The Real Deal reported the owners were in talks with four banks to land a refinancing that would replace a $531 million loan issued by Freddie Mac in 2009. Trump holds a 4 percent stake in the complex, generating $5 million in income last year through April 15, according to his financial disclosure.